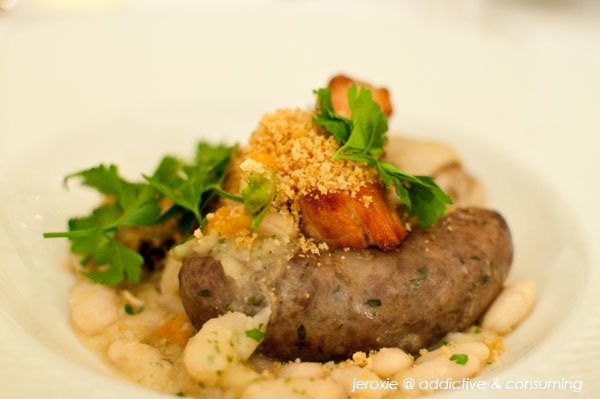 Tour de France Stage 12 means Cassoulet! Tami (one ‘m’, clearly not me, but an interesting confluence nonetheless) over at Running With Tweezers did a gorgeous post on tapenade, tomatoes provencale and roasted apricots for Stage 11, which you should definitely pop over and drool at. So here goes – I’ve made cassoulet a few times, and it’s pretty hard to stuff up if you’re paying any attention and using plenty of delicious ingredients. The catch is that I’ve been urgently called to Sydney on work (and obviously I should have written this much earlier, but to be fair, I only just got back from two days on the Gold Coast – speaking at a conference – and a week in Tassie setting up CISA and researching the ethical raising of pigs. Okay, we also ate a lot of Bruny Island Cheese). This photo was taken by the fabulous Penny (@jeroxie) over at Addictive and Consuming. This hearty stew varies considerably in different regions (and even within them, as per any famous dish made in various households), and it’s fun to imagine the many spirited debates southerners must have about the requirements for pork, quality pork sausage, lamb or duck confit. Personally, I reckon you simply cannot go wrong as long as there is free range happy pork (‘only one bad day’), sausage and duck. Yes, I realise that means this is a very rich dish – that’s the point. And how fitting that I am offering it to you here in Australia’s depth of winter, as I cannot imagine it having any appeal in the current French summer! Soak the beans overnight. Drain and put on the heat for 10-20 minutes, until soft but still al dente. Take off the heat, drain and set aside. Meanwhile, you should be making a stock from the trotter, garlic, onion, thyme, bay leaves, carrot & celery. Simmer in water for at least two hours to infuse the stock with loads of flavour. When you’re satisfied the stock has a lovely flavour, it’s ready for its next starring role. Meanwhile, fry the duck pieces just to brown and seal in delectable juices. Also fry off the sausages. You can then slice them and add to the beans or else leave them whole – this is purely a matter of your taste and aesthetic. Set the duck and sausage aside while stock comes to maturity. Once both the beans & the stock are ready, and the meat is browned, layer roughly, including the bacon pieces, in a casole, or a casserole dish or oven pot of some sort, ensuring some sausage is pushed in at the top. It’s useful to put the trotter in the bottom for more flavour. Pour half the stock in when you’ve half filled the pot. Stir the tomato paste or sugo through. I use my le Creuset (I should mention I have one that was a gift, & another that was found in the hard rubbish collection in Carlton – it has exactly *one chip* in the enamel in the bottom, but somebody threw it out – lucky us). Pour the rest of the stock into the pot, cover and put in a medium/low oven for around three hours (150-160C). Uncover after the first hour and allow the top to form a bit of a crust, cooking for a further hour or two, pushing the cassoulet down with a large spoon periodically. Pour more stock in during cooking if it dries out too much. Some people put bread crumbs on top to form the crust, but my understanding is that it’s more traditional to allow the beans and sausage to form their own crust by slow cooking uncovered at the end. 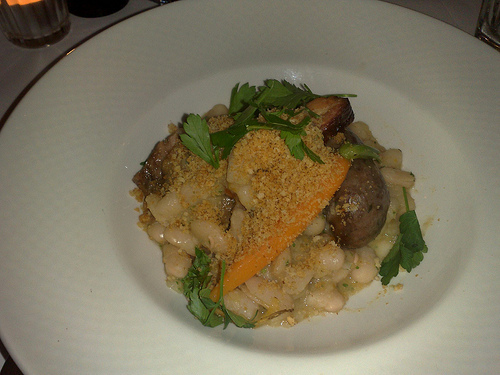 Posted on July 16, 2010 February 2, 2011 Categories cooking, food, recipeTags cannellini, cassoulet, duck, French, haricot, Languedoc, Mende, pork, Tour de France10 Comments on Tour de France Stage 12 means Cassoulet!